赵健竹, 汤隽, 马洁韬, 张树玲, 韩琤波, 邹华伟. 贝伐珠单抗联合卡铂与贝伐珠单抗单药治疗恶性胸腔积液的疗效和安全性[J]. 中国医科大学学报, 2018, 47(4): 291-293. ZHAO Jianzhu, TANG Jun, MA Jietao, ZHANG Shuling, HAN Chengbo, ZOU Huawei. Efficacy and Safety of Combined Bevacizumab and Carboplatin Therapy and Bevacizumab Monotherapy for the Treatment of Malignant Pleural Effusion[J]. Journal of China Medical University, 2018, 47(4): 291-293. Abstract: Objective To explore the efficacy and side effects of combined bevacizumab and carboplatin therapy and bevacizumab monotherapy for the treatment of malignant pleural effusion (MPE) through thoracic perfusion, and provide evidence for a clinical strategy.Methods We retrospectively collected 48 patients with malignant pleural effusion caused by advanced tumor effusion from January 2015 to November 2016 according to the inclusion criteria. All patients were diagnosed based on cell pathology or imaging. Patients received combined bevacizumab and carboplatin therapy (n=30) or bevacizumab monotherapy (n=18). The differences in clinical improvement, changes in images, symptoms of nausea and vomiting, neutrophil count reduction, and other side effects were compared between the two groups.Results There were significant differences in the efficacy (83.3% and 55.6%, respectively; P=0.039) and rates of grade 3 side effects (40.0% and 11.1%, respectively; P=0.033) between the combined therapy and monotherapy groups. No significant difference in quality of life improvement was found between the two groups (P=0.113). 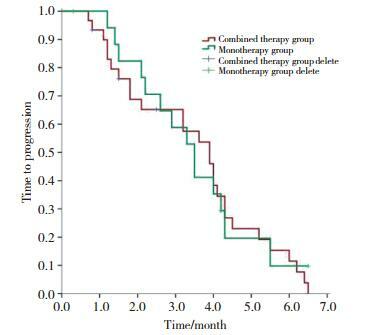 The median times to progression in combined therapy and monotherapy groups were 3.9 and 3.5 months, respectively, without statistical significance (P=0.873).Conclusion Compared with bevacizumab monotherapy, combined bevacizumab and carboplatin therapy is highly effective for the treatment of MPE with more severe side effects. There are no significant differences in the time to progression and quality of life improvement between these two therapies. We should choose appropriate therapeutic drugs according to specific patients in the clinic. JIANG L, LI P, GONG Z, et al. Effective treatment for malignant pleural effusion and ascites with combined therapy of bevacizumab and cisplatin[J]. Anticancer Res, 2016, 36(3): 1313-1318. TAMIYA M, TAMIYA A, YASUE T, et al. Vascular endothelial growth factor in plasma and pleural effusion is a biomarker for outcome after bevacizumab plus carboplatin-paclitaxel treatment for non-small cell lung cancer with malignant pleural effusion[J]. Anticancer Res, 2016, 36(6): 2939-2944.